In working the Clutterers Anonymous℠ program of recovery from cluttering, we have found that there are a number of tools available to assist us. We use these tools to help us achieve and maintain physical, emotional, and spiritual sobriety. 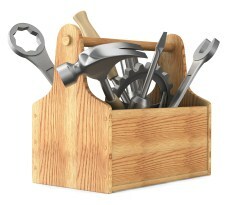 Many of us have found that we cannot abstain from compulsive cluttering unless we use some, or all, of the tools. ACTION is the magic word.We have found these actions helpful to create for ourselves an environment of order, beauty, and serenity. Service: The CLA℠ program gives us the opportunity to enhance our own progress by taking on various service responsibilities, from holding office to doing cleanup. As we serve, we risk moving out of isolation, to grow, and to practice the principles of our program within the fellowship. Service is giving back to the fellowship. Sponsorship: Sponsorship is a personal and private, one-on-one relationship between two clutterers. Sponsorship helps both the sponsor and sponsee. Sponsors have worked the 12 Steps and are someone further along the path of recovery than the sponsee. The main function of a CLA sponsor is to help the sponsee work the 12 Steps of CLA and is not necessarily a friend, but someone we can confide. Choosing a sponsor involves going to several meetings to find someone with whom we can identify–someone who has the type of recovery that we want. Meetings: We attend meetings to learn how the program works and to share our experience, strength, and hope with each other. Meetings give us an opportunity to identify with others who have our common problem and move out of isolation. Literature: We use CLA literature and A.A.® approved literature. * Literature is an always-available tool that helps us gain insight, as well as strength, to deal with our problem. Bookending: We bookend when we talk to other CLA members before and after taking difficult steps in our recovery. This way we can hold ourselves accountable for completing a specific task or project. Buddies: Buddies are CLA members and helpmates in recovery. We may call them with our daily plan, or ask for help with a project. Daily action: We do something each day to further our recovery, doing what we can, no matter how small. Our goal is progress, not perfection. Earmarking: We provide a place for our possessions and return them there. We create a home for anything before bringing it in. When we add a new item, we release an old one. For accessibility, beauty, and peace of mind, we keep some empty space. Focusing: Our goal is to do one thing at a time. Streamlining: We honor what we own by setting limits on our possessions. We keep only what we use and for which we have space. We realize that the more we acquire, the less we enjoy what we already have. Telephone: We use the phone to keep in touch with other members of the fellowship between meetings. Talking on the phone helps both members. Trust: We simplify our lives, believing that when we need a fact or an item, it will be available to us. *Alcoholics Anonymous® (the book commonly known as The Big Book®), Twelve Steps and Twelve Traditions (the book commonly known as the 12 & 12), “Questions & Answers on Sponsorship” (pamphlet)., “Came to Believe” (booklet), Daily reading and meditation (books), The A.A. Service Manual Combined With Twelve Concepts for World Service (book), The books listed below, which relate to the history of A.A.: A.A. Comes of Age, Pass It On, Doctor Bob and the Good Oldtimers. Reprinted and revised from the CLA leaflet, “Clutterers Anonymous: A Brief Guide.” All Rights Reserved. This is CLA Fellowship-approved literature. A.A. is a registered trademark of Alcoholics Anonymous World Services, Inc.